Gasp! Not only did I agree with Carrie Ann this week, if she keeps blogging like this for EW, I may grow to (wait for it) LIKE her! Remember to stay tuned to Ballroom Dance Channel for all the news on Dancing with the Stars! Carrie Ann Inaba blogs ‘DWTS,’ week 2 | PopWatch Blog | EW.com. More bonus pictures for you! We’ve been lucky enough to find the pictures of the pros and celebs in their costumes separately and thought we’d share the wealth! One of our wonderful members at Ballroom Dance Channel Social found these for us. Please join us for some great discussion about the show, we’d love to have you as a member! We thought we’d give you a weekend bonus and share the promotional pictures for Dancing with the Stars 8. Here they are! 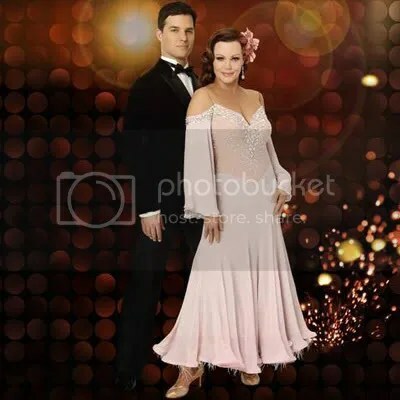 Remember that you can learn to dance like these stars at Ballroom Dance Channel!